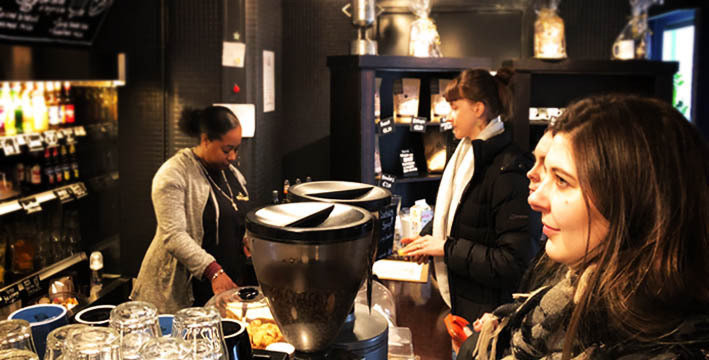 Customers buying coffee at Heilige Boontjes are joining their quest to provide training and employment opportunities for young offenders. During a recent SPARK safari trip to Holland, I was lucky enough to be able to spend some time with a group of UK and European Social Enterprises, all driven by a desire to create positive social change. Somehow or other, they are all on a quest to a better world. The clarity of this message gives them a major communications advantage when it comes to building their communities. Simply by becoming customers of these businesses and organisations, people can become part of their movement for positive change. The reason why a social enterprise has been created is usually obvious from day one and this makes their communications task much easier. By having an easily identifiable quest, they can target their audiences with a clear message. A message that can make an all-important emotional connection, as well as providing a clear narrative on which to build the stories and content that they want to share with the world. When it comes to building customer and user communities, the power of the ‘quest’ should not be underestimated, and it is not exclusive to social enterprises. All businesses, however big or small, should have a relatively easy time describing what they do and how they do it. And this is fine. But we live in a world of self-validation, where everyone can claim the excellence of their product or service. The question a company really needs to be able to answer is ‘Why?’ Why should anyone use their products and services? Why are they better? If they can answer these questions then they are likely to be well on the way to identifying their quest, and being able to explain in one or two simple sentences how they are making life easier, nicer, more beautiful, more lovely. So, take a lesson from the socially driven sector. Identify your quest and give your audience the chance to join you on a journey to better world. For more on the search for ‘why’, Simon Sinek’s famous TED talk on how great leaders inspire action is a good place to start.